This week Members will make their way slowly back to Washington to begin the second session of the 114th Congress. The Senate is out for another week while the House will gavel in on Tuesday afternoon and take its first big vote of the year on Wednesday — on the Reconciliation bill repealing parts of Obamacare and defunding Planned Parenthood. An announcement is expected from the other side of Pennsylvania Avenue this week, as President Obama prepares an executive action on gun control. By now you know — "reconciliation" is an expedited process for special bills that reduce the budget deficit to come up for consideration in the Senate without a 60-vote cloture threshold. The current reconciliation bill, H.R. 3762 from Rep. Tom Price [R, GA-6], would repeal key parts of the Affordable Care Act: the individual mandate, the employer mandate, and the Independent Payment Advisory Board (IPAB), and would defund Planned Parenthood for one year. The bill passed the House on 10/23/15 with a vote of 240-189 and passed the Senate on 12/04/15 with a vote of 52-47. The bill is expected to pass Congress this week and head to President Obama's desk, where it will be vetoed. The House will also vote on several bills that would bring changes to the regulatory system and class action lawsuits. The SCRUB Act (Searching for and Cutting Regulations that are Unnecessarily Burdensome" is designed to identify and eliminate outdated and ineffective regulations. The legislation put a bipartisan, BRAC-style commission in place to review regulations and make recommendations for repeal,” according to the sponsor. The bill "seeks to end the practice of enacting federal regulations through sue-and-settle litigation"… According to the sponsor: "“Regulation by litigation subverts the normal regulatory process, denying Americans, especially Northeast Georgians who depend on agriculture, a seat at the national table. This bill would shed light on backroom deals between federal agencies and special interests – increasing transparency to provide the public its say in executive decision-making. This Administration’s rush to settle with litigious outside groups is costing us jobs and income. We’re giving more people a voice in the outcome." “The Fairness in Class Action Litigation Act is a simple, one-page bill, that furthers a common sense principle that should apply to class action lawsuits in the future. Only those people who share injuries of the same type and extent should be part of a class action lawsuit,” according to the sponsor. We at POPVOX are working to help you weigh in on the proposal, with a "non-bill action" that will send your comments not just to Congress, but also to the White House. We will have more information on that once the proposal is unveiled. 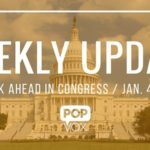 Be sure to check the POPVOX blog throughout the week for more details. If you work with an organization that will release a statement or conduct a campaign on the proposal, get in touch for more information. A bill to "deny the transfer of a firearm or the issuance of a firearms or explosives license or permit (or revoke such license or permit) if the Attorney General: (1) determines that the transferee is known (or appropriately suspected) to be engaged in terrorism or has provided material support or resources for terrorism, and (2) has a reasonable belief that the transferee may use a firearm in connection with terrorism. Allows any individual whose firearms or explosives license application has been denied to bring legal action to challenge the denial." "make[s] it unlawful for any person to operate a gun show unless such person: (1) has attained 21 years of age; (2) is not prohibited from transporting, shipping, or receiving firearms and has not violated any federal firearms requirements; (3) has registered with the Attorney General as a gun show operator and has provided a photograph and fingerprints; (4) has not concealed material information nor made false statements in connection with a gun show operator registration; and (5) notifies the Attorney General of the date, time, and duration of a gun show not later than 30 days before the commencement of such show and verifies the identity of each vendor at the gun show." To eliminate the requirement that a firearms dealer transfer a firearm if the national instant criminal background check system has been unable to complete a background check of the prospective transferee within 3 business days. To protect individuals by strengthening the Nation's mental health infrastructure, improving the understanding of violence, strengthening firearm prohibitions and protections for at-risk individuals, and improving and expanding the reporting of mental health records to the National Instant Criminal Background Check System. "To regulate assault weapons, to ensure that the right to keep and bear arms is not unlimited, and for other purposes."